Originally uploaded by sick ridiculous. Hey folks. I am alive! After a much enjoyed, if not deserved, winter break in New Orleans and Pittsburgh, I am back to a somewhat normal life. This means I am coming in to school every day. Most people are here yet, though, so it's kind of boring. 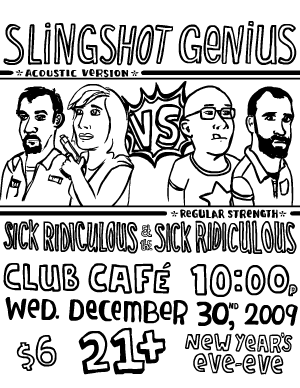 Anywho, just before the New Year (actually New Year's Eve-Eve) Sick Ridiculous and the Sick Ridiculous played a show at Club Cafe, right here in Pittsburgh. If you've never been, Club Cafe is a great venue that hosts a number of smallish national acts, usually of the folk/singer-songwriter variety. I have seen a bunch of good bands there, and the sound is great. 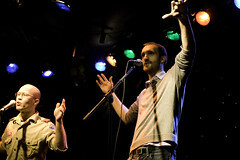 We had a awesome time opening for our friends in Slingshot Genius. We even busted out a soon-to-be-favorite, "Duckles Chuckles," which we wrote when our friends Stephen & Laura moved to Washington D.C. Please enjoy some pictures by clicking though. Our friend Shafeeq also took some pro-style pictures. Thanks bro! Also, peep this incredible poster that Tom made for the show.